Brian Shiro is looking forward to commanding his first mission to the Mars Desert Research Station on Crew 89 in early 2010. In July 2009, he was a crewmember on a 30-day mission to the Flashline Mars Arctic Research Station in the Canadian Arctic. During that time, he logged nearly 29 hours doing field science wearing a spacesuit on 9 EVAs traversing over 80 km. A seismologist by training, Brian is a veteran of numerous geophysical field expeditions to remote locations including Antarctica, Alaska, Canada, and various tropical Pacific islands. His diverse background includes summer jobs working in upper atmosphere physics, carbon nanotubes, satellite radar mapping, geochemistry, glaciology, and high performance computing. Brian also has experience working at three NASA centers and served as the principal investigator for a Mars Geophysical Lander mission proposal to NASA in 2003. Brian holds a B.A. in Integrated Science, Geology, and Physics from Northwestern University and a M.A. in Earth and Planetary Sciences from Washington University in St. Louis. While working on his Ph.D., he left academia to accept a position as Geophysicist with NOAA at the Pacific Tsunami Warning Center in the wake of the 2004 Indian Ocean tsunami. 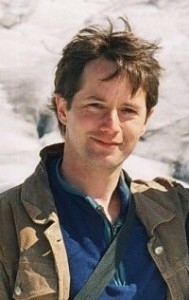 In summer 2005, Brian attended the International Space University (ISU) Summer Session Program in Vancouver, Canada, where his concentration was space policy and law. The following year he gave an invited presentation on his ISU team’s work involving global wildfire forecasting to the United Nations Committee on the Peaceful Uses of Outer Space in Vienna, Austria. Brian is now a third year distance M.S. student in the University of North Dakota’s Department of Space Studies and expects to complete the degree in 2010. Originally from Arkansas, Brian now lives in Hawaii with his wife and young son. He is a father, marathon runner, SCUBA diver, aviation enthusiast, environmentalist, and outdoor extreme sports junkie. He blogs about trying to become an astronaut at http://astronautforhire.com/. 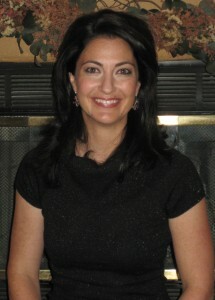 Carla Haroz has been able to combine her interest in human exploration of space and her interest in Russia by working for NASA Johnson Space Center, both in Houston and in Moscow. Her NASA career spans ten years of working in the International Space Station Mission Control as a flight controller for disciplines supporting environmental control, life support, emergencies, thermal, and electrical systems onboard the ISS. Currently working in the International Liaison Group, leading a team of flight controllers in Moscow’s Mission Control, she deals with the intricacies of international cooperation on space endeavors. Carla received a B.S. in Aerospace Engineering and a B.A. in Russian Language and Literature from the University of Texas at Austin, and a M.S. in Aeronautics and Astronautics from the Massachusetts Institute of Technology. She’s currently working on another M.S. in Arctic Engineering from the University of Alaska and has been accepted to pursue her PhD in Bioastronautics at the University of Colorado. An avid traveler, Carla has ventured to all seven continents, but is anxious to get her footprint on MDRS’s Mars. She will be MDRS Crew 89’s Executive Officer. 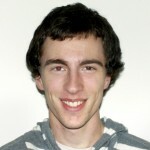 Mike Moran is a Physics and Astrophysics undergraduate student at Michigan State University, from where he expects to graduate in spring of 2011. 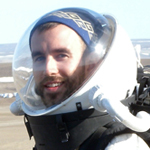 As a member of Lyman Briggs College, his undergraduate experience has included research in all of the basic sciences, something that future Mars astronauts will need to have experience in to successfully complete mission goals and connect findings across the various disciplines. He is also involved in numerous extracurricular activities, from running races to playing guitar. While at the MDRS, Moran will be working as the Crew Astronomer by using the telescope in the Musk Observatory. He will be analyzing both Algol EA/SD variable stars and planetary transits by observing the luminosity changes during the eclipses. The Algol variables experience two minima: one when both the fainter companion passes behind and in front of the brighter companion. The luminosity dip during the planetary transits, however, will be much less (roughly 1-2%) due to the smaller size of the exoplanets. Moran hopes that these projects will be completed successfully, thereby refining the measurements of the eclipse times and physical properties of the eclipsing bodies. The added benefit of working in a simulated Mars environment will just make the research that much more enjoyable. Darrel Robertson is currently designing a robotic bird for remote exploration and reconnaissance, although his background is mostly in rocket propulsion. He has been interested in space exploration from a young age and attended the European Space School and Star City Space Camp before studying for a Bachelors degree in Physics with Space Science and Technology at Leicester University. He worked as an intern for two summers at NASAs Jet Propulsion Laboratory investigating the Shoemaker-Levy comet crash with Jupiter and the Galileo Huygens Probe entry into Jupiter’s atmosphere. He completed a Masters and Doctorate at M.I.T. in Aeronautics and Astronautics with his thesis research devoted to design of a novel thruster for spacecraft propulsion. He then completed Post-docs at the European Space Agency (ESTEC) and then the University of Stuttgart’s Institute for Space Systems on spacecraft electric propulsion. After getting married he moved back to Boston and spent 4 years working on aerospace fire and explosion before moving to Seattle to work on commercial space launch vehicles. He recently moved to Dayton, Ohio where he is now working on the robotic bird project. In his spare time Darrel enjoys any kind of adventure sport such as mountaineering, caving, rock climbing, whitewater kayaking, scuba diving, skiing, snowboarding. He loves travel and his adventures have taken him to places such Iceland, Canada, Kuwait, Hawaii, and Dominica. He looks forward to being the team 89 crew engineer at MDRS. Luís M. R. Saraiva is originally from Portugal, where he lived until 2004 where completed a “Licenciatura” (equivalent to BSc+MSc) in Biology, having specialized in Ecology, Paleontology and Microbial Evolution and Behavior. He then moved to the University of Cologne in Germany, after being selected to be a Fellow of the International Graduate School in Genetics and Functional (Class of 2004-2008). While there he completed several courses, lab rotations and his PhD thesis in Genetics/Neurobiology. He also completed courses in scientific writing and presentation; presented his work in many international conferences and published several research papers in high-impact factor scientific journals. In the Summer of 2008 he applied and was not selected to be an Astronaut for ESA. In despair he moved to Boston where he collaborated with a research group at Harvard Medical School, trying to answer a very specific question of one of his projects. In October 2008 he moved to Seattle, where he is currently a Postdoctoral Fellow at the Fred Hutchinson Cancer Research Center in Seattle. He is currently trying to unravel the neural circuits that regulate innate behaviors, like aggression and fear. In addition, he is also trying to discover the olfactory receptors that recognize pheromones and how these olfactory cues can modulate behavior. Earlier in 2009 he came across the Mars Society and still is overwhelmed with his recent selection to be part of the MDRS Crew 89. While at the MDRS, Saraiva will be working as the Crew Biologist sampling and testing extremophiles and conducting an environmental impact study. He is also the Health and Safety Officer and although he prefers the term “Medic” he will still do his best to keep both the Crew and the Hab safe and in good health. Marsonaut Saraiva has big expectations on the MDRS and will do his best to successfully accomplish his mission as part of the Crew 89 and get us one little step closer to Mars. Kiri L. Wagstaff’s primary goal is exploration, whether discovering new areas or devising new algorithms. She holds a Ph.D. in Computer Science (Cornell University) and an M.S. in Geology (University of Southern California), and she continually seeks ways to combine elements of both in her work. She is a researcher at the Jet Propulsion Laboratory in Pasadena, CA, where she develops new methods for onboard data analysis by rovers and orbiters, volcano sensor network monitoring, and fast transient detection in radio array data. Her other projects have included predicting crop yields from Earth orbit, determining stromatolite biogenicity (created by life or not? ), tracking the polar caps on Mars, and evaluating the radiation sensitivity of machine learning algorithms. Kiri will serve as MDRS Crew 89’s Crew Geologist, Information Officer, and Journalist. She plans to investigate methods for automatically geo-tagging images collected by MDRS crews when on EVAs. She grew up in the canyons of southern Utah and is delighted to return to this area for a mission at the Mars Desert Research Station. Outside of work, she enjoys ballroom dancing, knitting, hiking, drinking tea, and continually learning new things. 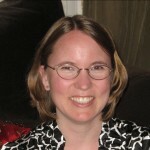 Her blog, titled “What I Learned Today,” chronicles her ongoing learning experiences at http://www.wkiri.com/today/.